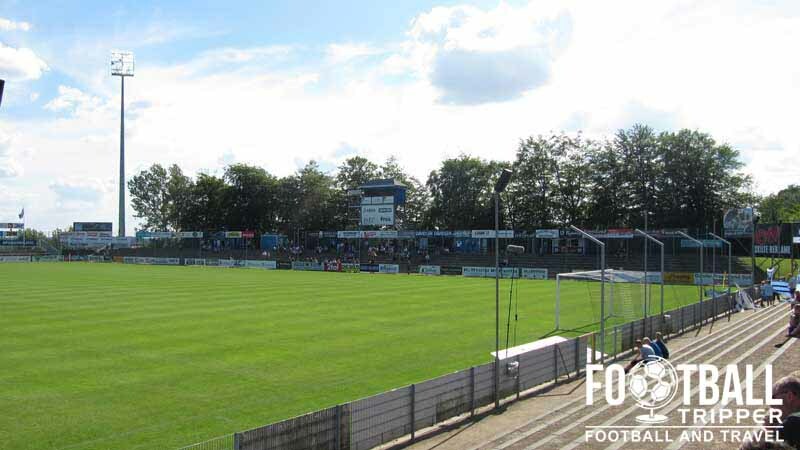 Haderslev Fodboldstadion known as Sydbank Park for sponsorship reasons is a purpose built football stadium located in the Danish town of Haderslev. First opened in 2001, the ground has a capacity of 10,000, including 150 VIP seats and 22 spaces for members of the press. Haderslev Stadium is a purpose built football ground located within the small town of Haderslev, home to SønderjyskE Fodbold who currently play in the Danish Superliga after making their first appearance in the top-flight in the 2000/2001 season.Constructed in less than a year after the club gained promotion, the ground opened with a capacity of around 5,700 which included 1,500 seats. 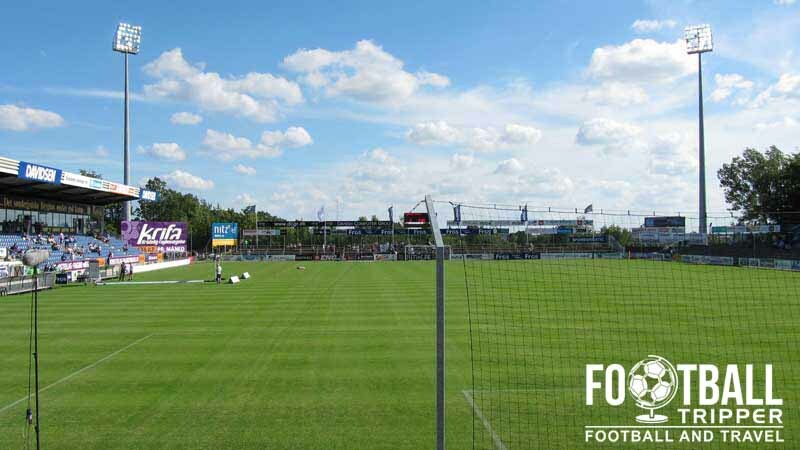 To date the average attendance of SønderjyskE matches is around 3,268 with the club typically selling out a handful of fixtures each season against the larger teams in the division such as FC Copenhagen and AaB Fodbold. The record attendance was set against Brøndby IF when 8,302 fans came to the match during the 2008 season. 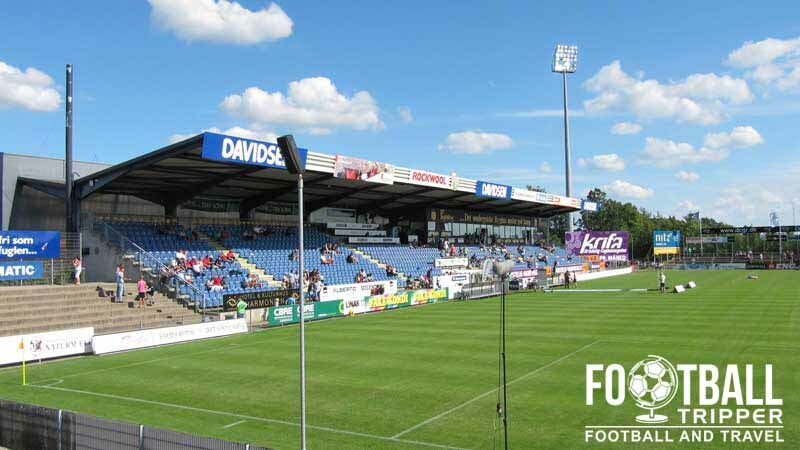 When the Danish Football Association (Dansk Boldspil-Union) updated their stadium requirements for top-flight teams in 2011, volunteers rallied around to erect a new section of temporary seating which added an additional 1,500 seats in order to satisfy the newly introduced minimum requirement of 3,000. Two years later this was removed as the club began to construct a new permanent grandstand costing over 75 million DKK. Equating to around £8 million, the construction work was completed in March 2014, with the inaugural match held against FC Midtjylland in the Super League. As well as the addition of 3,000 covered seats, the renovation work sought to improve the match day experience for all supporters, with the installation of new state of the art television screens, lightning system and public toilets. Sydbank Park is comprised of four stands: North, East, South and West. Away fans are housed behind the goal within the south stand which has very basic facilities and no roof coverage whatsoever. Purely a terrace section with no seats available to the visiting supporters, tickets can be purchased on the entrance for 115 kr including fee. We can’t find any information regarding a Soenderjyske Fan Shop at Sydbank Park so it’s probably safe to assume that it isn’t usually open on non-matchdays. You could always purchase official merchandise from the club’s online store which is hosted by Sport 24. There aren’t any stadium tours currently available for Sydbank Park. Tickets to see Soenderjyske can be purchased through the usual channels including online from the official website, from the club’s reception during the working week and from the entrance to the stadium on matchdays. Please note that tickets purchased before kick-off on the day of the match carry a surcharge of 15 kr in order to offset increased staffing costs. Sydbank Park is located within Haderslev Idrætscenter some 1.6 km north of Haderslev town centre next to the local “Cathedral School”. Most Football Trippers can easily walk to the stadium in just under 15 minutes. 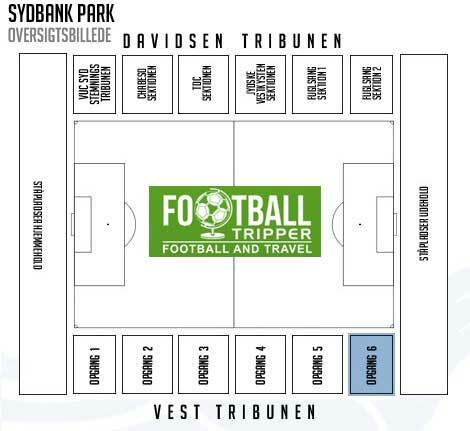 There’s very limited on-site parking at the stadium and wider Haderslev Idraetcenter, and the car parks which are visible are usually reserved for guests of the club. The small town no longer has its own railway station after the single track Haderslevbanen closed in 1978. The nearest railway station is therefore the one in Vojens some 13 km west of Haderslev. The three closest major airports to Haderslev are: Sønderborg (70 km), Billund (77 km) and Esbjerg (92 km). As there isn’t too much difference in distance between them all you can shop around for the cheapest flights. The three star Hotel Norden is undoubtedly the pick of a very limited bunch due to its central location and modestly priced rooms. Hotel Harmonien is more expensive and Haderslev Vandrerhjem og Campingplads isn’t for everyone!